MEET KATIE SUTTON, WORLD AUTHORITY ON HOW TO HANDLE GROWN-UPS. A must read novel for anyone requiring tips on how to control this bizarre species by (undiscovered) genius Katie Sutton - a fabulous, funny new teenage character who rivals Georgia Nicholson with her wit. Katie is an expert on operating grown-ups. She knows exactly how to get the best out of them, so she decides to write a guide to help the world's long-suffering teenagers do the same. But then Katie's mum starts dating the awful Yellow-Tie Man. Suddenly Mum is acting completely out of character and totally out of control! For everyone's sake, Katie needs to use all her expertise to get rid of him - and quick! I received this lovely little title for review only recently. It wasn't a book I would have asked for or picked up in a shop but I am so glad that I have had the chance to read it. Jenny Smith's book has been compared to Louise Rennison but I actually think this book is better than any of the Georgia Nicholson books I have read (I never bothered to finish them). What I really liked about the book was Katie the main character. She is just a lovely gorgeous teenage girl who is fab without...moreI received this lovely little title for review only recently. It wasn't a book I would have asked for or picked up in a shop but I am so glad that I have had the chance to read it. Jenny Smith's book has been compared to Louise Rennison but I actually think this book is better than any of the Georgia Nicholson books I have read (I never bothered to finish them). What I really liked about the book was Katie the main character. She is just a lovely gorgeous teenage girl who is fab without airs and graces and tantrums. I wish more of the teenage girls you read about in fiction were like her because she was just so lovely and normal and totally without any kind of ego or quirk that can irritate the pants of me. The whole story was really nice in that it had really lovely morals. The family involved were really normal and you could see that they really loved each other. I loved how the whole story played out (there were some crackingly funny moments thrown in). I also loved the idea that almost the entire village was related to one another as I imagine that isn't all that uncommon in some of these little villages in the UK. 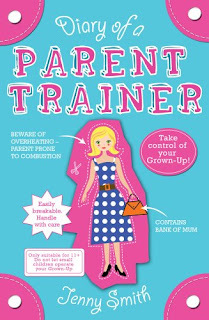 All in all a fab book which would be ideal for younger teenage girls. Up to date, modern and 'with it' without being cringy with a fab new role model who is awesome.